Here we will see a detailed article related to the starting methods of three-phase induction motor. Three phase Induction motor or Ac motor is started by itself but we require some starter or other methods for proper starting and controlling induction motor. The induction motor is started by itself that we know. When the 3 phase supply is provided to the stator, a magnetic field is produced which rotates the rotor and motor starts. 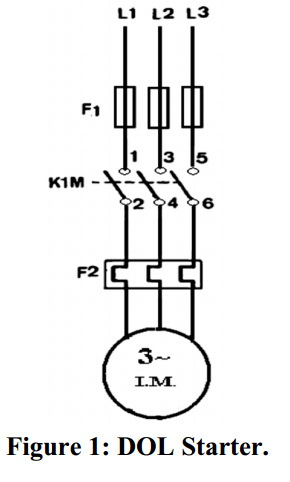 But at the starting of the induction motor, starting current is very large which may damage motor windings. Therefore, a starter is provided in induction motor not for providing starting torque to induction motor but for protection of induction motor. Direct on line starter is the simplest and inexpensive methods among all other methods for starting induction motor. DOL starter is connected directly between the supply and motor terminal. This starter is connected directly to the supply line, so its called “Direct-On-Line” starter. DOL starter consists of some safety mechanism which provides protection to the motor. This starter power circuit and control circuit figure shown below. DOL starter is usually used in squirrel cage induction motor. Induction motors have high starting current like 6 to 8 times the rated current. It has high starting torque like 2 times the full load torque. DOL is used for controlling this high starting current to the motor. This starter is mostly used for less than 5 kW rating motors. 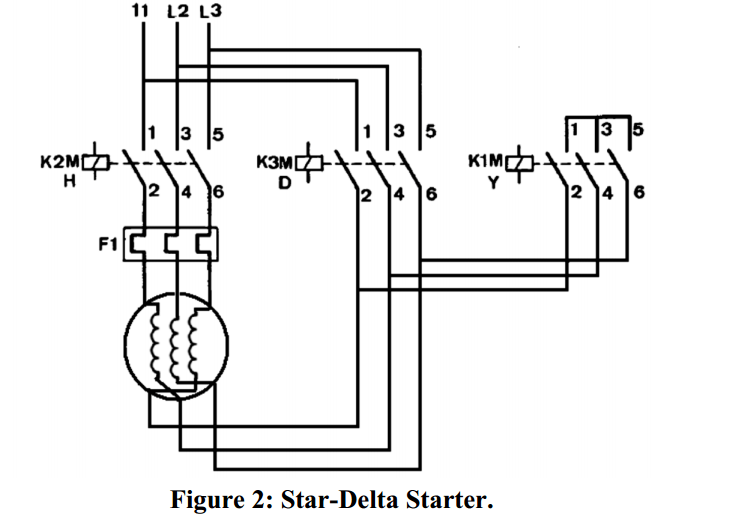 Star-delta starter is a very common method for starting an induction motor. In this methods, we provide a reduced voltage at the starting of the induction motor. Star- delta starter figure is shown below. Here you can see at the time of starting, the starter is in star connection. So that in starting period motor get reduced current. Motor gets a one-third current of the starting current. After the start of the motor, by switches, star connection is converted to delta connection. In a delta connection, motor gets full load current as required. At the time of the starting period, when the stator windings are start connected, each stator phase gets voltage VL/√3, where VL is the line voltage. As we know torque is square proportional to the voltage. Therefore, starting torque required to start the motor is also one-third torque obtain by delta starting. Star-delta starting is one of the commonly used methods for starting induction motor. As the other starter, the autotransformer starter is also used. This starting method is more expensive than any other previous method. This starter is complex in construction and has a more complicated operation. The operating principle of autotransformer starter is the same as the star-delta starter. Starting current to the induction motor is reduced by applying reduced initial supply voltage. Starting current and starting torque is obtained by correct tapping on autotransformer. 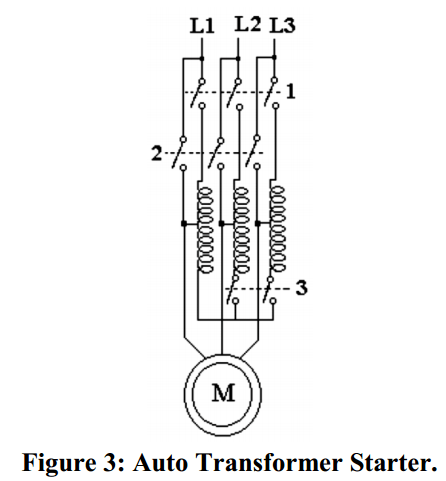 The figure shows the autotransformer starter. This type of starter is suitable for both star and delta connection motor. After the starting period, this starter will disconnect and motor gets full load voltage. In above, we saw three starters for effective starting of I.M but is the case of slip ring induction motor it would be much easier to start the motor. In slip ring induction motor, we can add external resistance in rotor circuit through slip ring and brushes. At the starting period, rotor resistance is set to the maximum value and gradually resistance decreases with increase in speed until it becomes zero. This type of method is bulkier and more expensive compared to another method. Also, it produces considerable heating when the high current passing through external resistance. Starting frequency is also controlled by this method. 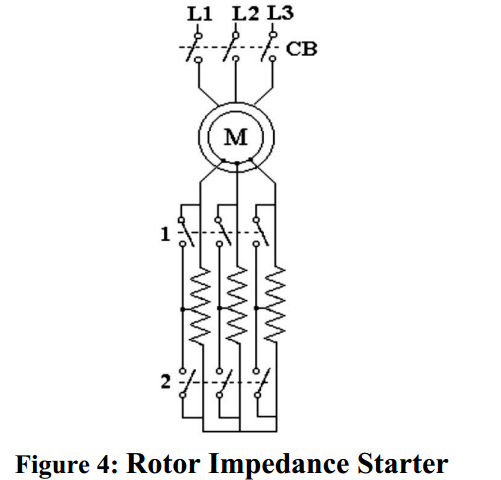 The figure shows the connection of external resistance in the rotor of the induction motor. This method is not used widely. Most industries use squirrel cage induction motor with a starter for starting purpose. Three phase induction motor is a generally self-starting motor. We do not require to give external starting torque for starting induction motor but the starter is provided with an induction motor for limiting starting current. Three phase induction motor provided with the different starter like star-delta starter, autotransformer starter and DOL starter etc. For slip ring induction motor, by providing external resistance in rotor circuit we can also limit starting current. So these are the various methods for starting of the induction motor. If you have any doubt regarding this article feel free to ask in the comment section.